Is TumorNext-HRD the right test right for you? If you’re a woman with ovarian epithelial cancer, this is one of two tests we offer that will help you and your clinician identify whether PARP inhibitors – one of the latest treatments available – could help you. The same test also shows if you’re at risk of other cancers. It’s about giving a complete picture to ensure you receive targeted treatment at a time when you need it most. PARP inhibitors, used in conjunction with chemotherapy, are drugs that can ultimately destroy cancer cells. The TumorNext-HRD test will identify if this is a suitable treatment for you. Ask your clinician how you can get this test – and also ask about our TumorNext-BRCA test which focuses specifically on the two genes BRCA 1 and BRCA 2. It involves drugs which block an enzyme used by cancer cells to repair damage to their DNA caused by chemotherapy, but it doesn’t affect healthy cells. In effect, it causes tumour cells to die. 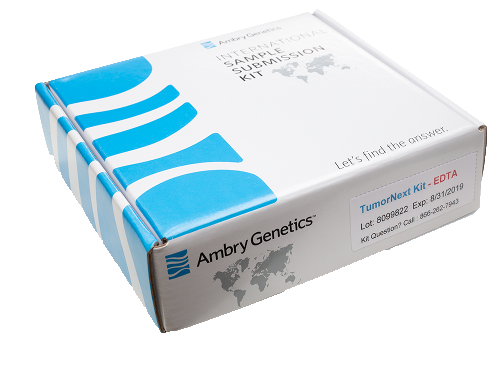 The TumorNext-HRD test analyses 11 genes in your DNA to give you and your clinician clear indications of whether targeted PARP inhibitor treatment will help you. This test can also indicate if you have a hereditary risk of developing other cancers – and therefore what steps you need to take for further screening or monitoring. The hereditary aspect of the TumorNext-HRD test analysis can also indicate if other members of your family have significantly increased risk of certain cancers – so they too can arrange for appropriate monitoring or screening. This test is an analysis of 11 specific genes in the DNA of your tumour tissue. You will have had a biopsy before you received your cancer diagnosis, and we can use the sample taken at that time so you do not need an additional medical procedure to take this test. This test is only available with authorisation from your clinician, who will receive your test results directly. Buy the test. You will receive an email asking you to confirm that you have authorised ELG to be given a sample of your tumour tissue. Your sample will be analysed and a report will be generated, usually within three to four weeks of receipt of your sample in the laboratory. Your clinician will receive a comprehensive analysis of the 11 genes in your DNA and particularly any mutations which indicate whether or not PARP inhibitor treatment could help you. The report will also indicate if mutations have been identified which are associated with the hereditary risk of developing other cancers, so that you and members of your family can take action to protect your health in future.